Make bow ready for shooting? Product information "TD Recurve White Waves NG Made in Germay"
A Recurve Bow with an oiled central part of German copper beech. The limbs that are decorated with a bright design have a very good throwing performance. This bow is also ideal for semimisten. Passed the course with a White Waves NG is a guarantee of success and fun at archery. The bow is extremely comfortable paired in the pullout behavior working with a great work of the limbs. The 66 inch long Recurve Bow - for Archery Made in Germany - Sesslach. Bow length is 66 inches. The White Waves NG is available in the following drawing weights: 16, 20, 24, 28, 32 & 36 lbs @ 28 inches. Equipped is the Recurve Bow White Waves with a dacron string. Stand height recommendation: 8 -8 ½ inches, max. extension length: 33.5 inches. An archery product made by Beier Germany. 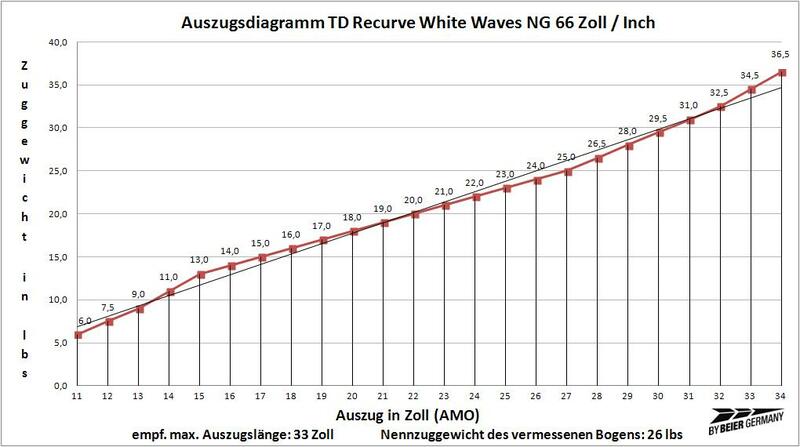 Related links to "TD Recurve White Waves NG Made in Germay"
Customer evaluation for "TD Recurve White Waves NG Made in Germay"
Wax for Strings Tex-Tite 1 oz.